A Tribute to Olivier Messiaen and "The Quartet for the End of Time." On January 15, 1941 French composer Olivier Messiaen premiered his seminal work "Quartet for the End of Time" within the confines of Stalag VIII-A, a Nazi prisoner-of-war camp in Silesian Germany. The ensemble (clarinet, violin, cello, and piano) played upon broken instruments in front of an audience comprised of his fellow prisoners and prison guards in the brutal cold. Opening on February 5th, 75 years after this premiere performance, Anno Domini Gallery presents a Messiaen-inspired exhibition of new paintings by renown artist Barron Storey entitled "Quartet" and live performances entitled "End of Time" by Cellista (Freya Seeburger) and her Juxtapositions Chamber Ensemble. 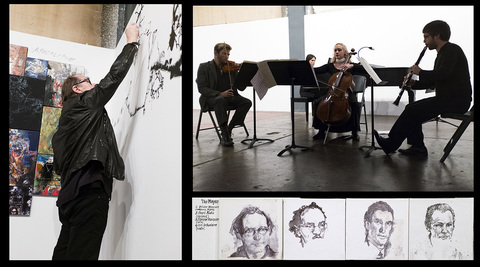 This presentation at Anno Domini is a small immersive theater event building on Cellista's work in storytelling and interweaves San Jose's narrative into a piece, showing the immediacy of the Quartet to San Jose's past, present and future. Performing the Quartet is the Juxtapositions Chamber Ensemble: violinist Ishtar Hernandez, cellist Freya Seeburger (Cellista), clarinetist James Pytko and pianist Naomi Stine. Barron Storey will also be in attendance at the performances drawing insitu on his metamorphic temporary mural dedicated to Messiaen and his fellow prisoners of war. Exhibition admission free & open to the public during gallery hours Tuesday-Friday Noon-7pm, Saturday Noon-5pm. This page contains a single entry from March 10, 2016 10:22 PM. The previous post in this blog was TWO BUCK Tuesday March 15th. The next post in this blog is Vote for Your Favorite Cinequest "Unite" Painting.